The perfect accompaniment to Apple's Keynote application, Quartet provides you with 20 original motion themes, 45 motion backgrounds, 100 animations, and 90 still themes. Use them to make your next presentation convincing and unique! 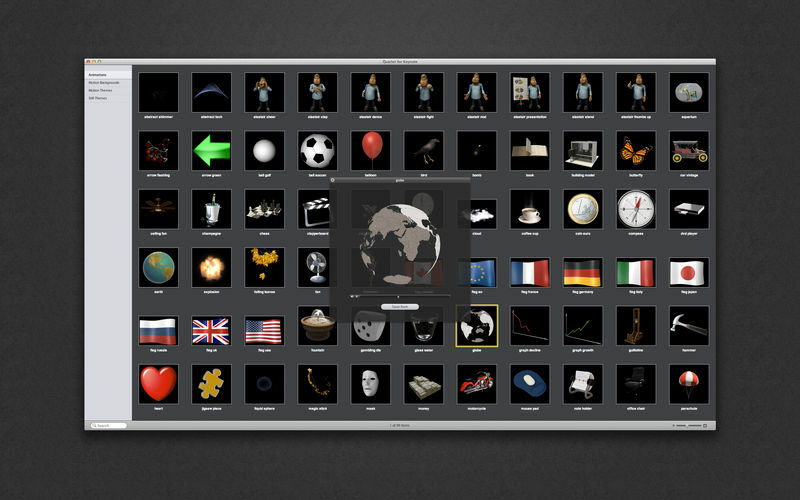 The Still Themes set consists of 90 high-quality designs for Keynote presentations. These are more than just beautiful backgrounds – each one of them includes up to 24 different master slides, which lets you choose the best layout for your information. The themes are available in up to five sizes: 1920x1080, 1680x1050, 1280x720, 1024x768, and 800x600 pixels. Let us take care of the appearance of your presentation, while you focus on the content. Animations is a bundle of dazzling designs for adding magical motion to your Keynote presentations. Because the animated images have transparent backgrounds, they are easy to work with and embed into your slides. It has never been easier to position, blend, resize, rotate, overlay, and underlay. You can also use Animations with movie-editing applications such as Final Cut Pro, Final Cut Express, and Motion. Motion Backgrounds is a striking set of 45 animated designs for adding intensity to any Keynote presentation. Copy a motion background, paste it to your slides, and watch them liven up. All backgrounds are available in 1024 x 768 px. In addition, the files are arranged for looping to allow endless playback of any background in the package. Simply choose QuickTime Inspector in Keynote and select Loop under the Repeat pop-up. 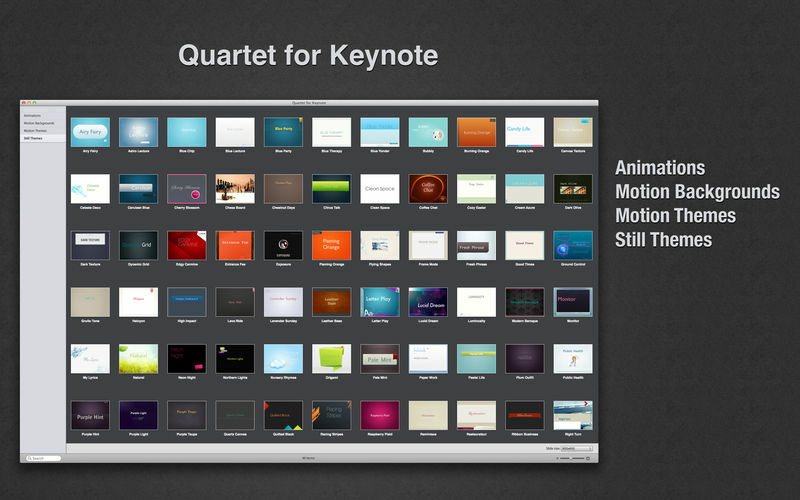 The Motion Themes set is created for exclusive Keynote presentations. The pack includes 20 motion themes, each providing 14 master slides, which allow you to choose the ideal layout for your ideas, proposals, and solutions. Use the matching motion backgrounds, fonts, frames, and bullet styles to drive your point home. 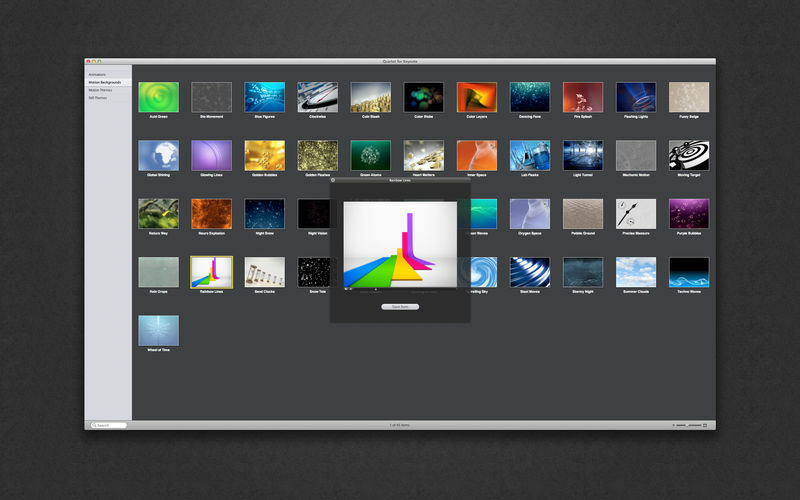 All themes are available in two sizes: 800 x 600 and 1024 x 768 pixels, and can be exported to QuickTime. Fixed crash which occurred on launching app with latest macOS version.